Listen and order now on ArkivMusic, Amazon, iTunes, and all major retailers and digital outlets. 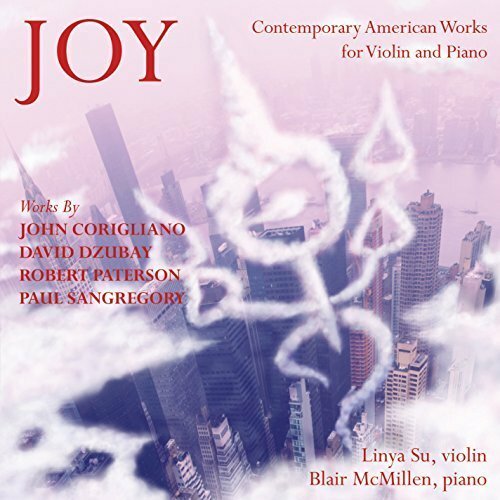 JOY contains four contemporary works for violin and piano by four living American composers, and features Linya Su on violin and Blair McMillen on piano. Composers include John Corigliano, David Dzubay, Robert Paterson and Paul SanGregory. Joy was produced by Robert Paterson and recorded, engineered, mixed and mastered by legendary engineer and producer Adam Abeshouse. This album is a labor of love that celebrates friendships. The works and composers were all chosen by Linya Su, who has worked with and befriended all of the composers on the album. She met three of the four composers at Indiana University where she earned her Bachelor's and Master's degrees, and met John Corigliano at Lehman College (CUNY) where she earned her M.A.T. In Linya's words, "all the musical works contained in this album reflect the spirit of the Empire State Building. Whether you choose to catch the view from the top of the building or from the ground level, you are part of an energy that comes from something larger than yourself. Even though each work is a unique representation of the individual composer’s artistic voice, the pieces themselves share some distinctive qualities. Each one is characterized by vitality, diversity, positivity, and is unquestionably colorful." The first work on the album, Sonata No. 1 for Violin and Piano is by New York City-based composer Robert Paterson. Hailed as a "modern day master" (AXS.com) and often "the highlight of the program," (The New York Times), Paterson has received numerous awards for his works in virtually every classical genre, including the Composer of The Year Award from the Classical Recording Foundation. The work on this album is in four contrasting movements, and is influenced by everything from Romanticism, record scratches, and schizophrenia to ticking clocks and the music of Igor Stravinsky. The second work, Sonata for Violin and Piano, is by one of America's most celebrated composers, John Corigliano. Corigliano has won numerous awards for his works, including the Pulitzer Prize, many Grammys and countless other awards. His sonata from 1963 is considered a classic twentieth century work for violin and piano, and was one of the works that catapulted his career early on. Although his sonata seems to contain hints of Poulenc and Paganini, Berg’s plangent violin writing, Stravinsky’s rhythmic energy, and Ives’ dissonances, like all great composers, his compositional voice is uniquely his own whether with this work or his entire output. Capriccio for Violin and Piano by David Dzubay was originally written for violinist Corey Cerovsek, and has gone on to be performed by numerous other violin and piano duos, including the performers on this album. Like other capriccios, in Dzubay's words, his work contains "contrasting textures and moods, unexpected chromatic twists, repeated sections, and a certain capricious flow." Dzubay has had a long and illustrious career, has won numerous awards, and has been the Chair of the Composition Department at the Indiana University Jacobs School of Music for many years. The final work on the album, Reverberation by Paul SanGregory, was written while Paul was studying composition at Indiana University. In his program notes for this work, SanGregory describes his piece as "a short and simple suite for violin and piano" and with a focus on form, expression, and "simple, direct communication." Although he grew up in Ohio and went to school in Indiana, SanGregory currently resides in Taiwan and is Associate Professor of Music Theory and Composition at National Kaohsiung Normal University. SanGregory's music has been performed across Asia, the U.S., Europe, Canada, Russia, Australia, New Zealand and South Africa. Born in Taipei, Taiwan, Linya Su is an award-winning violinist who has won first prizes in numerous national music competitions in her native country. Shortly after making her concerto debut with the Taipei Symphony Orchestra at the age of 13, she was officially honored by the government of Taiwan as a gifted young musician of the year, and was granted extraordinary permission to come to the United States at a very young age to study with the world-renowned violin pedagogue, Raphael Bronstein. As a chamber musician and recitalist, Linya Su has given performances in major concert venues including the Gasteig Kulturzentrum in Munich, National Music Concert Hall of Taiwan, Carnegie Hall, Alice Tully Hall, Lincoln Center, and Hong Kong Cultural Center. She has been featured on various media including WQXR New York, the Christian Radio Station “GoodNews 90.9FM” in Taipei, “Philharmonic Radio Taipei 99.7FM,” and on a television program in Manchester, Vermont in interviews highlighting her career, as well as musical performances. Her concerts have been critically acclaimed by the Taipei newspaper China Post, the Herald-Times in the United States, and by Hong Kong music critic, Mr. Chow Fan-Fu (周凡夫). In addition to her extensive performing experience, Su has been honored by the esteemed Chi-Mei Cultural Foundation for the Arts, the Corigliano Music Scholarship Award, the Chamber Music Society of Lincoln Center, the Freeman Foundation, the Golden Key International Honor Society, Pi Kappa Lambda national music honor society, Friends of Music Scholarship, Mary Jane Metcalfe Memorial Scholarship, and Mik Van Embden Nahm Memorial Scholarship. Linya Su holds degrees from Indiana University (B.M., M.M. ), Lehman College, CUNY (M.A.T. ), and Teachers College, Columbia University (Ed.D.). As a violinist, music educator, and devotee of arts, cultures, nature, and humanities, she aspires to integrate these passions into every aspect of her life. Blair McMillen has established himself as one of the most versatile and sought-after pianists today. He leads a multifarious musical life as soloist, chamber musician, conductor, and pedagogue. The New York Times has described him as “riveting,” “prodigiously accomplished and exciting,” and as one of the piano’s “brilliant stars.” Highlights from recent seasons include concertos with the St Paul Chamber Orchestra and the Albany Symphony, the Piston Concertino for Piano with the American Symphony in Carnegie Hall, and a 3-week solo tour of Brazil sponsored by the US State Department. Comfortable in an immense variety of musical styles, McMillen has delved into music well beyond the traditional classical canon. His concerts often include medieval keyboard manuscripts next to improvisation-based music, and Classical/Romantic-era solo piano repertoire with music of today's younger composers. He frequently collaborates with artists of other genres, and he commissions solo works that stretch the boundaries of the piano and the traditional recital format. McMillen is pianist for the American Modern Ensemble, the six-piano "supergroup" Grand Band, and the Perspectives Ensemble, among others. He is also the co-director of the Rite of Summer Music Festival, an indie-classical concert series held on New York City’s Governors Island. Rite of Summer celebrated its sixth season in 2016 with several world premieres, as well as a performance of John Luther Adams's epic "Inuksuit," played by nearly 75 percussionists overlooking New York Harbor. Blair McMillen holds degrees from Oberlin College, the Juilliard School, and the Manhattan School of Music. He lives in New York City, and has served on the music faculty at Bard College and Conservatory since 2005.